Modernism in architecture is characterized by its emphasis on form over ornament; appreciation of materials and structure instead of idyllic revival constructions; and the adroit, methodical use of space. Several different styles of modern architecture in the United States developed between 1930 and 1970 such as the International, Expressionist, Brutalist, New Formalist, and Googie movements. The roots of modern architecture can be traced to the 1893 Chicago World’s Fair, which was composed entirely of cutting-edge buildings and cemented the United States’ role as a world leader in art, architecture, and technology. The head architect was Daniel Burnham, who recruited the most prominent American architects, including Louis Sullivan’s firm Adler and Sullivan, to design the temporary buildings for the Fair. Louis Sullivan is most well-known for his aesthetic philosophy “form follows function,” which became the rallying cry for the modern movement. Sullivan’s rejection of ornamentation and clarity of structural function embodied the value of democracy, the importance of nature, the autonomy of the individual, and the earnest expression of function without extravagance. One of the many young architects inspired by the 1893 Chicago World’s Fair was Frank Lloyd Wright, the leading force in shaping modern American architecture in the 20th century. At the Fair, Wright encountered Japanese architecture in its traditional form at the Japanese government’s official pavilion. The building featured a half-scale reproduction of a Japanese temple. The open plan, horizontality, broad roofs, carefully wrought craftsmanship, and non-structural walls used in the temple would inform Wright’s design aesthetic for the rest of his career. 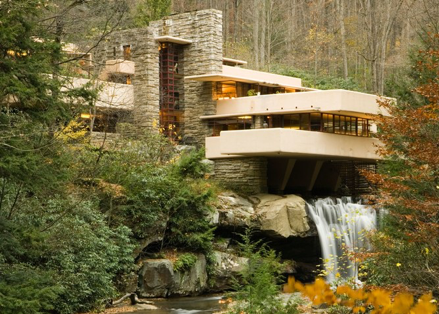 AMERICAN MODERNISM: Frank Lloyd Wright. The Kaufmann House known as Fallingwater, Mill Run, PA, 1939. Photo by Walter Bibikow. Getty Images. EUROPEAN MODERNISM: Walter Gropius. Exterior of the Bauhaus, Dessau, Saxony-Anhalt, Germany, 1925-1926. Photo by Gili Merin. Arch Daily. Young European architects were enraptured by Wright’s bold abstract forms stripped of ornament. In addition to the bevy of young American architects influenced by Wright and practicing in the Prairie Style, European Modernists Walter Gropius and Mies van der Rohe, who would become major fixtures of the Bauhaus, began to incorporate some of Wright’s more abstract forms into their own work. Staatliches Bauhaus, known simply as the Bauhaus, was the epicenter of the modern movement in Europe. 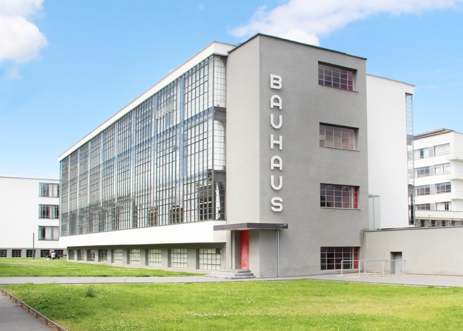 The Bauhaus was a German school of architecture, sculpture, painting, design, and craft, led by Walter Gropius, in operation from 1919 to 1933 that brought the modern movement to international prominence. Bauhaus leaders Walter Gropius, Marcel Breuer, and Ludwig Mies van der Rohe left Germany in the late 1930s to escape growing Nazi aggression against its European neighbors. Gropius and Breuer began teaching at the Harvard University School of Design, where Gropius was chair, and Mies van der Rohe became a professor at Chicago’s Armour Institute, now the Illinois Institute of Technology. Prior to the arrival of other European modernists dispersed by escalating tensions in Nazi Germany, Rudolph Schindler and Richard Neutra came to the United States and began working with Frank Lloyd Wright. Schindler and Neutra became well known on the West Coast for their expert blend of European rationalism with Wrightian organicism. These expats greatly influenced generations of American architects, popularizing the European modernist aesthetic throughout the United States. Architects such as Philip Johnson, Paul Rudolph, IM Pei, Edward Durell Stone, were educated with modernist ideals which evolved into regional iterations of modern architecture. Architecture firms such as the New York-based Skidmore, Owings & Merrill, created iconic modern office buildings and high rises all over the country. 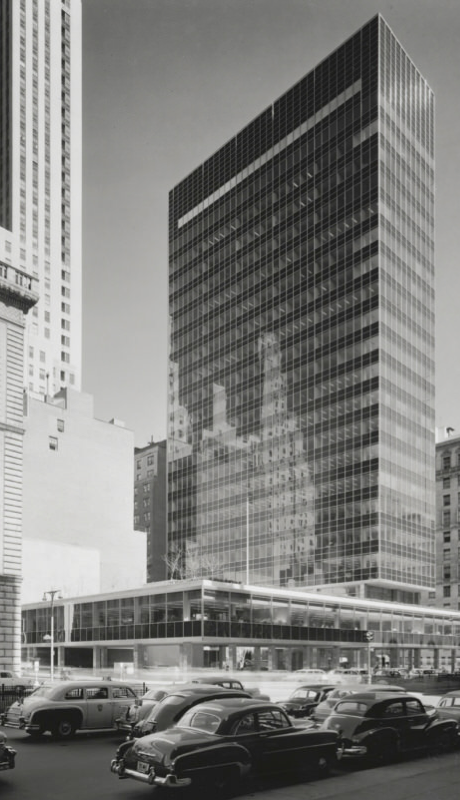 INTERNATIONAL STYLE: Gordon Bunshaft, Skidmore, Owings & Merrill, Lever House, Manhattan, New York, 1952. Photo by Ezra Stoller. © Esto. 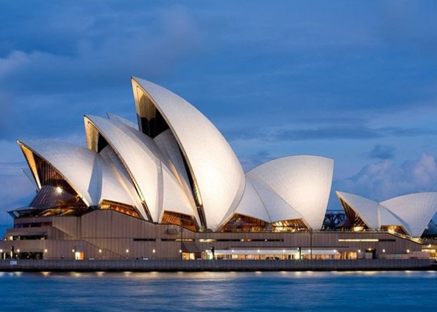 EXPRESSIONIST: Jørn Utzon, Sydney Opera House, Sydney, Australia, designed 1957, completed 1973. Photo by Hemis. Alamy. 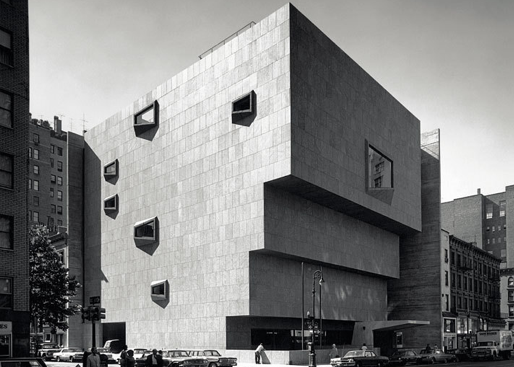 BRUTALIST: Marcel Breuer, Whitney Museum of American Art, Manhattan, New York, 1966. Art Forum. 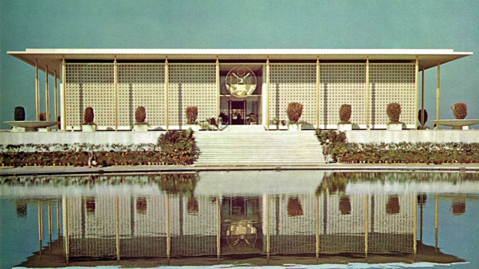 NEW FORMALIST: Edward Durrell Stone, United States Embassy, New Delhi, India, 1959-1960. Edward Durrell Stone Archives. GOOGIE: Eero Saarinen, TWA Flight Center, Queens, New York, 1962. Acroterion. HOW DO I SPOT A MODERN BUILDING? IS THERE MODERN ARCHITECTURE IN LOUISIANA? YES! While Louisiana is well-known for its French, Spanish, and Acadian architecture, Louisiana is also home to many beautiful modern buildings. 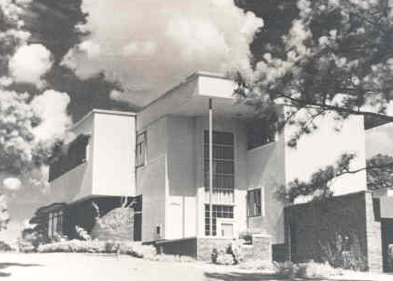 Modernism first began to take hold in Shreveport, Louisiana with the construction of 3 Samuel Wiener International Style homes in the early 1930s. By the 1950s, Shreveport was home to dozens more Wiener buildings, a Richard Neutra home, and Edward F. Neild skyscrapers. 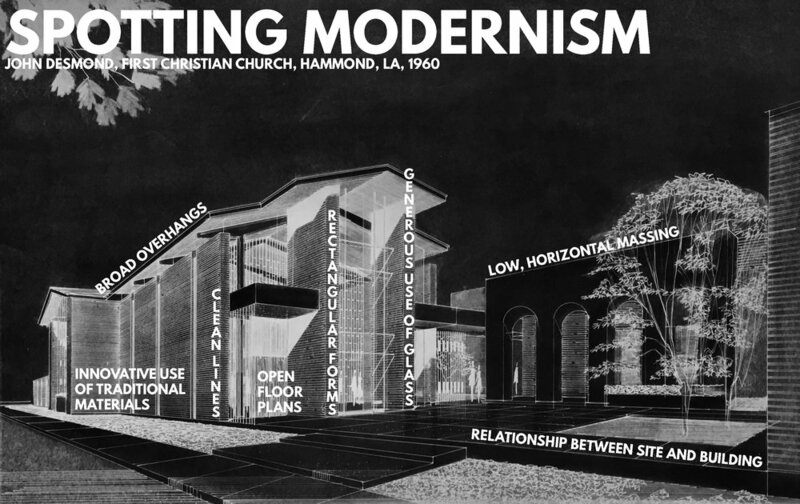 Modernism began to become popular in New Orleans in the 1950s. The greatest practitioners of modernism in New Orleans were Curtis & Davis, who designed the Superdome, and Albert Ledner, who designed many houses in the area. New Orleans was a little slow to catch on to modernism, but its popularity soared as architects developed conscientious methods to blend modern architecture with historic streetscapes. Scale, local materials, and the natural environment were important factors in the design of modern buildings in New Orleans. Over in Baton Rouge, architect John Desmond designed buildings like the Student Union at Louisiana State University and in his hometown of Hammond he designed dozens of homes, churches, schools, and other civic buildings. Desmond incorporated local historic design elements into his New Formalist modern designs in Hammond. Louisiana modern architecture is distinct because of its keen relationship to the Louisiana historic built environment and natural surroundings. SHREVEPORT: Samuel Wiener. The Samuel Wiener House, Shreveport, LA, 1937. Louisiana National Register of Historic Places Database. NEW ORLEANS: Curtis & Davis. Louisiana Superdome, New Orleans, LA, 1967-1975. Photo by Franck – Bertacci circa 1975. The Historic New Orleans Collection. NEW ORLEANS: Albert Ledner. The Sunkel House known as the Ashtray House, New Orleans, LA, 1961. Curbed. HAMMOND: John Desmond. St. Albert Catholic Student Center at Southeastern Louisiana University, Hammond, LA, 1962. Photo by Anna Marcum. WHAT IS SPECIAL ABOUT HAMMOND MODERNISM? Beginning in the late 1950s, John Desmond designed over 100 modern buildings in his hometown of Hammond, Louisiana. John Desmond (1922-2008) was born in Denver, Colorado and raised in Hammond, Louisiana. Desmond graduated from Hammond High School in 1937 and Tulane University with a degree in architecture in 1941. He earned a Master of Architecture from the Massachusetts Institute of Technology where he studied under W.W. Wurster and Alvar Aalto. Desmond worked at Skidmore, Owings & Merrill in New York City and with A. Hays Town in Baton Rouge before starting his own practice in Hammond, Louisiana in 1953. In the early 1970s, John Desmond closed the Hammond practice and began operating John Desmond & Associates exclusively out of Baton Rouge, Louisiana. Desmond retired from architectural practice in 2002. John Desmond was awarded numerous professional honors throughout his career, most significantly the American Institute of Architects Fellowship for Significant Contribution to Design and the Louisiana American Institute of Architects Gold Award Lifetime Achievement Award. John Desmond receiving an American Institute of Architects award for his design of the new State Library building in Baton Rouge, LA. Photo circa 1958. Louisiana Historical Photographs of the State Library. John Desmond. The Desmond Residence, Hammond, LA, circa 1960s. Photo by Frank Lotz Miller. John Desmond Papers, Mss. 4792, Louisiana and Lower Mississippi Valley Collections, LSU Libraries, Baton Rouge, Louisiana. John Desmond’s modern buildings in Hammond differ from the pure modernism of the International Style in that they incorporate the decorative elements and design concepts with historical precedent. Architectural historians refer to this style of modernism as New Formalism since many architects incorporate the rational, streamlined principles of classical architecture. John Desmond adapted New Formalism to southern Louisiana by incorporating features and materials popular in regional architecture. Desmond’s early career Hammond buildings can be described as Acadian Modernism – New Formalist structures that conspicuously incorporate Acadian architectural features and materials such as pitched roofs, galleries, pavilions, large overhangs, timber framing with brick, and wooden columns. John Desmond expertly fuses Acadian design elements with the clean lines and broad forms of modernism in his residential and commercial architecture. 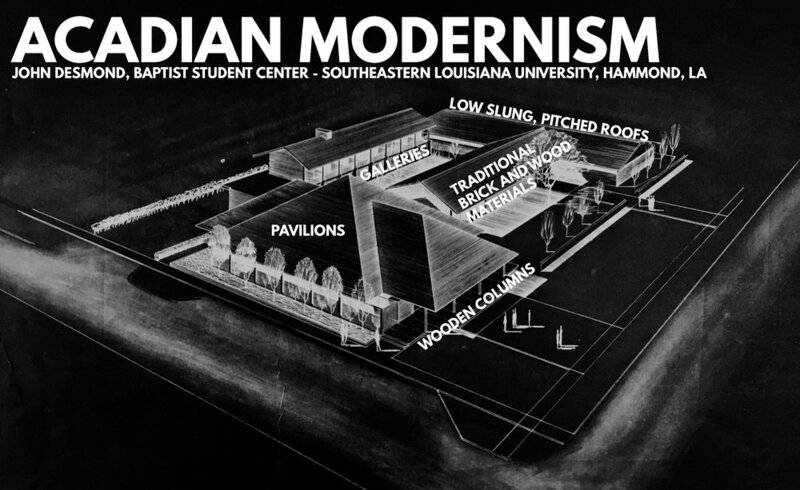 Desmond’s Acadian Modernism developed as he practiced in Hammond. One of Desmond’s first public commissions in Hammond, Miller Memorial Library, perfectly aligns with the International Style of architecture. The roof is flat and the building possesses strictly rectangular features. The form of Miller Memorial library would be well suited to a number of locations in the United States. However, John Desmond’s interest in the natural landscape and history of Southern Louisiana is evident in the siting of the library near a gorgeous oak tree abundant with Spanish moss and his effort to coordinate the color palate of the building with naturally occurring colors. Miller Memorial Library was constructed thanks to a generous donation of land and funds by Mrs. Carrie Norton Miller. The building functioned as such until 1995 and, while no longer a library, is still owned by the city of Hammond and open to the public. INTERNATIONAL STYLE: John Desmond. 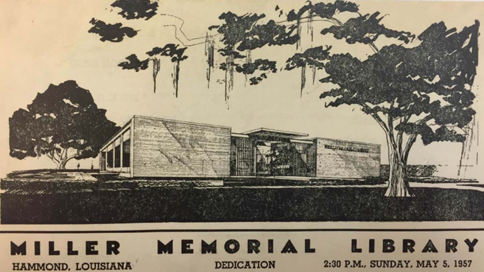 Illustration of Miller Memorial Library, Hammond, LA, 1956-57. Dedication flyer, 1957. Louisiana National Register of Historic Places Database. INTERNATIONAL STYLE: John Desmond. Miller Memorial Library, Hammond, LA, 1956-57. Photo by Frank Lotz Miller circa 1958. Louisiana National Register of Historic Places Database. First Christian Church is one the first building of John Desmond’s in Hammond that displays a distinct Acadian iteration of modernism. First Christian Church displays two of the most important features of Acadian Modernism – low slung, pitched roofs, and traditional brick and wood materials. Since the Frist Christian Church complex is a collection of buildings, it also hints at pavilion-like features. Hammond offers the special opportunity to see how John Desmond’s style evolved over time. 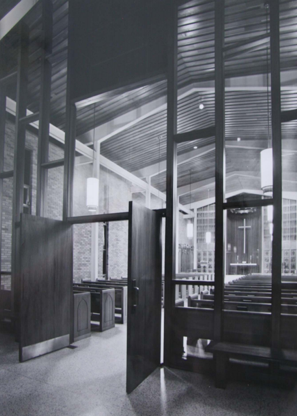 ACADIAN MODERNISM: John Desmond. First Christian Church, Hammond, LA, 1960. Photo by Frank Lotz Miller circa 1960. Louisiana National Register of Historic Places Database. Two of John Desmond’s Hammond buildings, Miller Memorial Library and First Christian Church, are listed on the National Register of Historic Places. It is remarkable for any city to have such a great density of one architect’s work. In southern Louisiana, it is unique to have so many residential and commercial works of high modernism in one place. Louisiana is well known for its many iterations of French Creole architecture. Modern architecture of the quality and concentration of John Desmond’s work in Hammond is truly unparalleled in the American South. WHERE CAN I LEARN MORE ABOUT MODERN ARCHITECTURE? HOW CAN I HELP SAVE MODERN ARCHITECTURE? LEARN: Start with the above resources and learn a little bit more about modern architecture and its relationship to your community. Understanding the significance of modern architecture is crucial in preserving modern buildings. SHARE: Get the word out! If you see a cool modern building, snap a picture and post it to Facebook, Instagram, or Snapchat. If you loved reading this crash course in modern architecture, share the link with your friends and family. Anything you can do to make your community more aware of modern architecture will be so helpful in advocating to save and maintain modern buildings. JOIN: Become a member of the Louisiana Architecture Foundation (LAF) or Docomomo US to learn more about modern architecture in Louisiana and kept abreast of any possible threats to modern gems in the region. RENOVATE: Do you own a mid-century modern home or thinking about buying one? If so, be sure to renovate thoughtfully with architectural integrity in mind. Be sure to check out our Guidelines for Modern Preservation brief to assist in developing your renovation plan. “Modern Architecture: Explore Icons of the Recent Past,” Saving Places: The Website of the National Trust for Historic Preservation, (Washington, D.C.: The National Trust for Historic Preservation, 2018), https://savingplaces.org/modern-architecture#.WmgQIPjwZ-U. Alexandra Griffith Winton, “The Bauhaus, 1919–1933,” Heilbrunn Timeline of Art History, (New York: The Metropolitan Museum of Art, 2000–,August 2007; last revised October 2016), http://www.metmuseum.org/toah/hd/bauh/hd_bauh.htm. Bauhaus Dessau, “Bauhaus Buildings in Dessau: Masters’ Houses by Walter Gropius (1925-1926)” (2017), http://www.bauhaus-dessau.de/en/architecture/bauhaus-buildings-in-dessau/masters-houses.html. Anna Marcum, Modern Prospective Easement Survey for Historic New England (Boston: Historic New England, 2017). J. Michael Desmond. “John Jacob Desmond.” In KnowLA Encyclopedia of Louisiana, edited by David Johnson. Louisiana Endowment for the Humanities, 2010--. Article published on January 6, 2011. http://www.knowlouisiana.org/entry/john-jacob-desmond. “Preliminary Inventory: January 2004; Revised 2008, 2012.” John Desmond Papers, Mss. 4792, Louisiana and Lower Mississippi Valley Collections, LSU Libraries, Baton Rouge, Louisiana, p. 4.